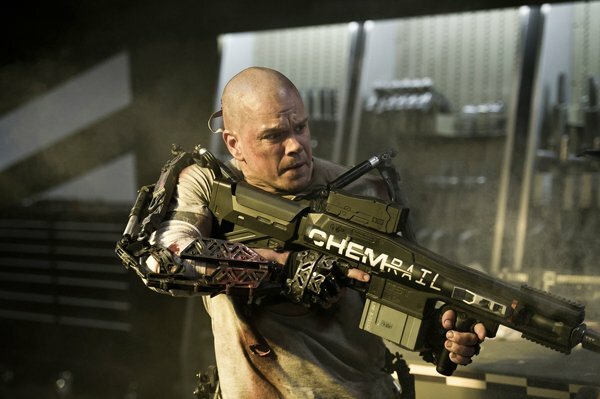 Fans have been waiting for Neill Blomkamp’s Elysium since the day the director’s sci-fi masterpiece District 9 was released. Now, four years later, we’re finally closing in on the film’s August release date, and today, the first trailer for the film has hit the web. To put it simply, this trailer is flat out awesome. Really, any chance for the public to see footage from this film was going to be great, but this preview certainly doesn’t disappoint, and should really build anticipation for those few moviegoers who weren’t already counting down the days. While there isn’t a ton revealed that we didn’t already know from the synopsis, the footage is stunning, as was expected for this film, and the world that Blomkamp has built looks absolutely fascinating, both on Elysium and on Earth. The explosions are epic, the action is great, and we get to see Matt Damon rip the head off a robot. Granted, it’s hard to judge a film based on a trailer, but if this one is any indication, we’re in for a film that’s fast, gritty, and has the potential to be a groundbreaking sci-fi spectacle. Blomkamp doesn’t make any attempts to hide his social agenda. In District 9 it was very clear, and this film is no different. In the first moments of the trailer it’s evident that this is a story of the 99% vs. the 1%. Matt Damon is representative of the 99%, and from the looks of his weapons, he’s intending to blow the 1% to smithereens. Damon in a sci-fi role is something that should really get audiences excited. He’s one of the premier actors working today, and when teamed with a director like Blomkamp, the result should be something incredible. Plus, he looks pretty badass in the role. Basically, August can’t get here soon enough. This film has the weaponry and the explosions that appeal to mass audiences for a summer blockbuster, but it seems like it’s far from typical mindless box-office fluff. Basically, it’s a film that should appeal to just about everyone, and I’d be surprised if it doesn’t do extremely well financially as well as critically. Yesterday the first reactions to the film, or at least a ten minute snippet, hit the web, and they were overwhelmingly positive. That doesn’t come as any huge surprise, but it’s still nice to see at least what has been shown so far doesn’t disappoint. Now that we’ve seen a trailer, it’s likely that more promotion for the film will head our way as the summer approaches. Be sure to check back with us, as we’ll post everything about the film as it comes in. Elysium arrives on August 9th, 2013. Check out the trailer below and then head to the comments section to share your thoughts.